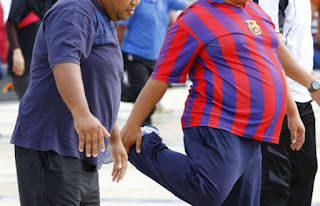 BANDAR SERI BEGAWAN, May 25 (Xinhua) -- Obesity prevalence is close to 30 percent while the diabetes rate is over 12 percent in Brunei, Brunei's minister of health told the World Health Organization Assembly in Geneva, Switzerland, local news daily Brunei Times reported Wednesday. Brunei's health minister, Dr Hj Zulkarnain said days ago in Geneva that tackling non-communicable diseases (NCDs) in Brunei poses challenges that cannot be met by Brunei's Ministry of Health (MoH) alone. In a statement issued by MoH, the minister said success demands intersectoral collaboration and significant behavioral change among the population. "We want to empower communities and individuals to take responsibility for their own health. This will not be straightforward," he said. The minister said to tackle the threat of NCDs, "we must face up to its key determinant -- societal behavior and lifestyles." He said Brunei adopted a two-pronged approach to the issue of behavior change. "At the individual level, we engage our clients using brief interventions at all points of contact. At the population level, we are actively developing choice architecture that provides a clear nudge towards healthier decisions." There is also a need to address the commercial interests that stand to gain from the marketing of sugary drinks and unhealthy foods, Zulkarnain said. The minister said Brunei will engage with the WHO and international partners to determine and test a comprehensive approach to address "profit-driven diseases." Zulkarnain headed Brunei's delegation to the 69th WHO Assembly, which saw the attendance of 194 WHO members. The theme for this year's World Health Assembly is "Transforming the World: The 2030 Agenda for Sustainable Development."